Treatments developed with ZFN/TALEN have a head start, but will others developed with CRISPR/Cas9 sprint ahead? The CRISPR/Cas9 genome-editing platform has recently taken the research community by storm, yet other genome-editing technologies such as ZFNs (zinc finger nucleases), and to a lesser degree TALENs (transcription activator-like effector nucleases) have been the workhorses for years, demonstrating and proving the genome-editing concept. Each technology enables gene editing by providing a targeting mechanism, that is, a means of recognizing specified DNA sequences. ZFNs and TALENs use proteins to recognize target DNA; CRISPR/Cas9, however, uses a small guide RNA (gRNA). In January 2013, publications illustrating the application of the CRISPR/Cas9 system for genome editing sparked an astonishing rate of adoption of this technology by the research community. The CRISPR/Cas9 platform offers a combination of ease-of-use, speed, and cost-effectiveness. “We have designed, and made publicly available through the nonprofit organization Addgene, human and mouse CRISPR/Cas9 gRNA and plasmid libraries,” stated Feng Zhang, Ph.D., an investigator at the McGovern Institute for Brain Research and a core faculty member at the Broad Institute of MIT and Harvard. “It is very easy to build gRNAs. You can just synthesize DNA oligos for them. To build 70,000 ZFNs or TALENs is a much more challenging task. The CRISPR/Cas9 system, researchers are aware, presents exciting therapeutic opportunities. Many researchers, however, are still focused on the system itself, improving its efficiency and specificity. They are also working on ways to enhance the delivery of CRISPR/Cas9 components to cells. Optimizations to the Cas9 enzyme, repair template, and gRNAs have made them more efficient both for knocking out genes and also for knocking in mutations. New Cas9 mutations and gRNA strategies are helping to increase specificity and limit off-target activity. Recent delivery advances include adeno-associated viral (AAV) vectors to deliver the Cas9 gene to the mammalian mouse brain in vivo as well as a method to modify the protein so it can penetrate the cell membrane. In addition, Dr. Zhang’s laboratory has developed a transgenic mouse that expresses Cas9 constitutively or under the control of Cre recombinase. This “Cas9 mouse” obviates the need to introduce the Cas9 gene on a study-by-study basis, and it conserves vector payload. When Dr. Zhang and colleagues introduced the Cas9 mouse, they demonstrated in vivo as well as ex vivo genome editing using AAV-, lentivirus-, and particle-mediated delivery of guide RNA. 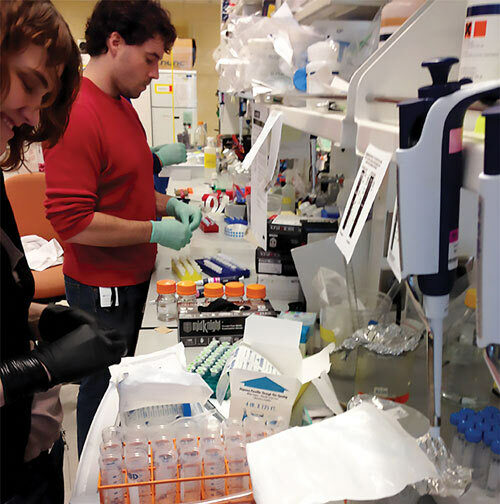 Addgene, a nonprofit organization, operates a plasmid repository for the research community. Plasmids are linked with articles, so scientists can always find data related to the materials they request. 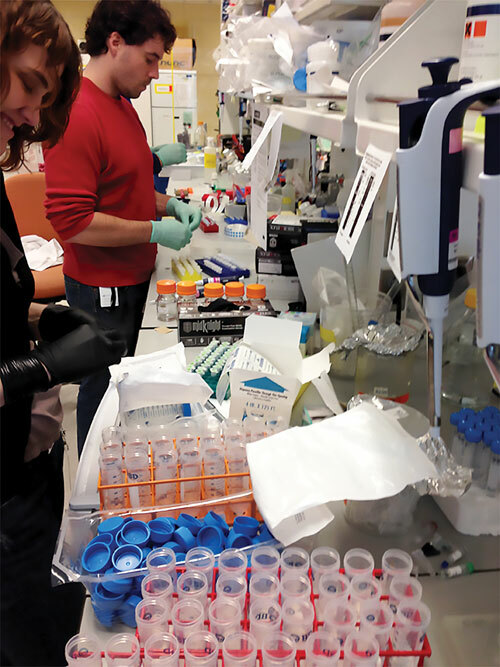 Before the Zhang laboratory at the Broad Institute began using Addgene, graduate students would assemble, package, and send the reagents. In 1991, Carl Pabo, Ph.D., solved the structure of a ZFP (zinc finger protein) when it was bound to its DNA target, an extremely important milestone in the successful development of engineered ZFNs. The structure demonstrated how the protein docks with DNA and suggested ways to modulate the protein’s specificity while maintaining the general architecture. An enormous amount is known about ZFNs. For example, technologies exist to optimize interaction with the DNA target to improve discrimination and affinity. These technologies can be used to increase on-target and decrease off-target activity. Furthermore, the core ZFN platform derives from a human protein whereas the CRISPR/Cas9 platform and TALEN proteins are bacterial in origin. The use of humanized engineered factors is advantageous if the ultimate goal is delivering the reagents therapeutically. 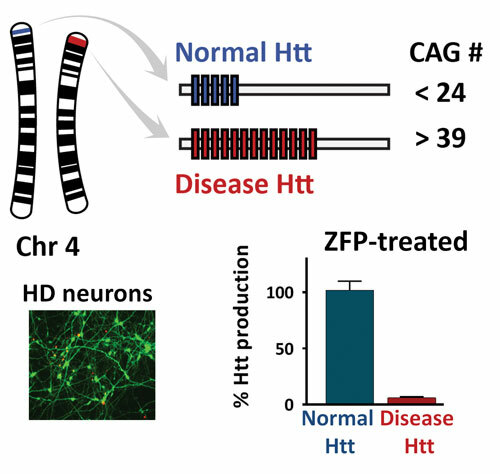 To illustrate enhancement of the specificity of ZFPs, Sangamo BioSciences initially made a ZFP TF (ZFP transcription factor) that suppressed both the Huntington gene wild-type and mutant alleles. Linker alterations and refinements in DNA-binding domains subsequently created a ZFP TF that was tailored to target only the mutant allele. The ZFN platform has been through the NIH Recombinant DNA Advisory Committee (RAC), the first body these types of gene-therapy products must progress through prior to clinical use. From a regulatory perspective, there are both platform-dependent and platform-independent issues. A series of assays is relied on to assess the risks of the modification as well as to assign some evidence of efficacy. “Sangamo has plowed a totally uncharted trail with genome-editing technologies, and established a path to move these types of therapies toward the clinic,” commented Philip Gregory, Ph.D., senior vice president and CSO at Sangamo BioSciences. In Sangamo’s HIV work, it was important to show that ZFN-modified cells were truly resistant to HIV infection both in vitro and in HIV animal models before progressing to clinical trials. In Phase I/II trials, patients were treated with 10–30 billion modified CD4 cells; to date, the therapeutic has been well tolerated. A recent New England Journal of Medicine publication, in collaboration with the University of Pennsylvania, provided the first evidence that patients whose cells were exposed to these ZFNs exhibited types of HIV resistance. The hypothesis was that in patients who agreed to go on antiviral treatment interruption, the unmodified T cells, which are targets for HIV infection, would decrease in number, but that the ZFN-modified T cells would be resistant. A 10-fold advantage in terms of the persistence of the modified T cells was demonstrated. Cellectis has been involved in TALEN research and development since the system’s inception, and has developed the knowhow to generate TALENs that display extremely efficient activity while retaining the high levels of specificity necessary for therapeutic applications. The company chose the TALEN technology due to its performance in terms of precision, efficacy, and safety. Initially, vectorization of TALENs in primary cells had to be addressed, particularly primary T cells, which transfect poorly and often display significant loss of viability. PulseAgile, Cellectis’ electroporation system, was used and coupled with TALEN mRNA to overcome this delivery difficulty. Gene inactivation frequencies of up to 90% can now be achieved in primary T cells with no significant impact on cell viability or subsequent growth. Cellectis has developed a generic platform for manufacturing T cells from third-party healthy donors to generate allogeneic “off the shelf” engineered CAR (chimeric antigen receptor)-positive T-cell products. The CAR T-cell universal platform provides a means to overcome the limitation of the current autologous approach that requires the manufacturing of CAR-positive T cells on a per patient basis, and allows the production of multiple patient treatments from a single manufacturing run. The first CAR-positive T-cell universal platform product is currently planned to enter into clinical investigation in the third quarter of 2015. According to Jacqueline Corrigan-Curay, J.D., M.D., director, Office of Biotechnology Activities (OBA), Office of Science Policy, National Institutes of Health, basic and clinical research projects that apply genome-editing technologies involving recombinant or synthetic nucleic acids may be subject to the NIH Guidelines for Research Involving Recombinant or Synthetic Nucleic Acids. The guidelines apply if the NIH funds the research, or if the research is conducted at an institution that receives NIH funding for recombinant or synthetic nucleic acid research. Some projects rely on protein-based nucleases. However, if these nucleases are delivered in plasmids or recombinant vectors, the projects deploying them are also subject to the NIH Guidelines. Clinical protocols that are subject to the NIH Guidelines must be registered with the OBA. Certain novel clinical protocols may be publicly reviewed by the NIH Recombinant DNA Advisory Committee (RAC). For example, the first protocol using ZFNs in stem cells was publicly discussed during the RAC September 2013 meeting. RAC discussions help inform oversight bodies such as IRBs (Institutional Review Boards) and IBCs (Institutional Biosafety Committees) that will review these protocols, as well as investigators developing new protocols. The OBA receives safety reports on active protocols and uses GeMCRIS, its comprehensive and interactive database, to track and analyze data across protocols and to identify safety trends. Summaries of events that are thought to be possibly related to the gene transfer are discussed at RAC meetings. For example, in June 2014, as part of a meeting, the OBA hosted a discussion of these technologies focusing on preclinical assay development. Major discussion topics focused on ways to increase the specificity of these nucleases and appropriate assays to assess off-target effects. The clinical experience to date has used ZFNs to disrupt a gene. In addition, ex vivo cell delivery was used in the recent HIV protocol published in the New England Journal of Medicine. Using these technologies to insert a gene as well as to accomplish in vivo delivery may involve additional challenges. According to Daniel Takefman, Ph.D., chief, of the FDA’s Gene Therapy Branch, Division of Cellular and Gene Therapies, Center for Biologics Evaluation and Research, the agency does not have specific guidance on the use of genome-editing technologies. Investigators interested in developing therapies utilizing these technologies can currently review the following guidance document: Guidance for FDA Reviewers and Sponsors: Content and Review of Chemistry, Manufacturing, and Control (CMC) Information for Human Gene Therapy Investigational New Drug Applications (INDs) and Guidance for Industry: Preclinical Assessment of Investigational Cellular and Gene Therapy Products. Additionally, the FDA encourages product sponsors to take advantage of informal communications between the agency and the sponsor/applicant prior to the submission of an investigational new drug (IND) application. These discussions provide a forum for the Agency to provide guidance to firms during product development and facility design, and to facilitate their compliance with the regulations governing development and post-approval marketing of products. The sponsor/applicant can request a meeting without an IND to discuss general product issues. Additionally, the sponsor/applicant may request a pre-IND meeting to obtain advice on bench and animal testing as well as on the design of clinical trials. The purpose is to reach agreement on the format for the IND, the scope and design of planned Phase I studies, design of animal studies needed to support human clinical testing, and product characterization issues. Pre-IND meetings are informal, and the feedback is nonbinding on either party.